Figs :: Oracibo.com - Food, Travel, Design and Cooking! It’s embarrassing to say that I have, for the past few years, coveted my neighbour’s fig trees. Every time I head towards east Vancouver, there they all are! Not far from where we live, is an apartment building that has quite a large one in the front yard. Almost every time I walk by, I stop to squeeze the figs to see if they are ready and no I haven’t stolen any! In 2008 we rented a villa in Umbria, Italy just outside the town of Tuoro. It has a marvelous view of Lago Trasimeno. It also had, just a few feet from our kitchen door, two fig trees. This is where my mania began. Our friends and neighbours were staying with us and so of course, there was talk about planting one in our front yard! Or, maybe I just began fantasizing about where. Not only that, there did not seem to be anywhere we could plant one! I so want one, OK! Speaking of stealing figs, Mark Rotella wrote a book called “Stolen Figs”. He is an Italian-American who travelled to Calabria to visit relatives and discover his homeland. He hooks up with Guiseppe who teaches him how to steal a fig without committing a crime! There’s good news and bad news. First the bad, a rhodo in our front yard has been feeling very unwell for a bit. It is in the middle of a garden bed that faces south and gets tons of sun. And after more fig fantasizing on my part, the lightbulb went on, what a perfect place for a fig tree! I bought a fig tree! It is an Italian Honey Fig and it has one fig on it. It is wonderful! Life is good! There will be a fig planting ceremony taking place in November on the day we plant the little darling in our yard. 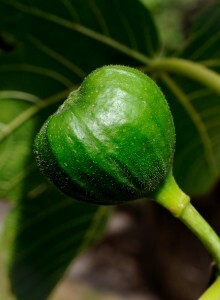 We are hoping our yet to be named fig, the Romans thought they bring abundance and plenty. Fig naming contest: if you have a name for our baby, let me know. So far, its Fico.